With its wide f/2.8 constant aperture, this superb high-speed wide-angle-to-medium-telephoto (26-78mm equivalent) zoom lets you create natural-looking pictures in almost any light, and shoot at faster shutter speeds too. One of the most compact and lightweight lenses in its class, its shallow depth of field at wide apertures allows you to create dramatic pictorial and portrait effects by softening background details so the subject looks more vibrant and three-dimensional. 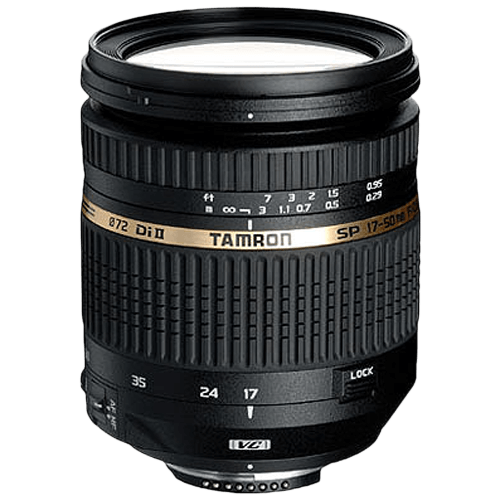 The Tamron B005 SP 17-50mm f/2.8 Di II VC Lens – For Nikon is a high-speed, wide-to-moderate-telephoto zoom lens designed for Nikon digital SLR cameras with smaller sensors. It covers the very popular 17-50mm focal length range (equivalent to 26-78mm in the full-frame 35mm format) making it extremely versatile. Tamron’s Vibration Compensation (VC) mechanism minimizes the effects of handheld camera shake (up to 4-stops), providing a means to great low-light shooting. The lens delivers impressive sharpness and striking contrast over its entire focal length and aperture range. A maximum aperture of f/2.8 delivers images enhanced by shallow depth-of-field, and smooth, natural transitions in out-of-focus areas of the image.